An ostrich with wings partially outstretched. The book of Job contains some of the most descriptive language about the natural world in all of Scripture. In Job 39 alone, we find God describing the natural history of animals including the mountain goat, deer, donkey, ostrich, horse, hawk and eagle in order to illustrate His omniscience and wisdom in creation. Although the authorship and date of Job is unknown, most scholars agree that Job is an ancient text. Therefore, Job contains descriptions of the animals living in the Levant region thousands of years ago. Remarkably, these descriptions read as if they are that of species with which we are familiar today, many of which still live in the same region. In this multi-part series we will examine the natural history of species mentioned in Job with a special focus on the description of the ostrich. We are interested in understanding what these historical descriptions of God’s creation tell us about the original condition of creation, how God may have made the animals, and what we can learn about how they have, or have not, changed over time. How is the Ostrich Described in the Bible? Among the animals described in the Bible, I am especially intrigued by the ostrich. While only found in Africa today, the ostrich were more widely distributed in the past. Ostriches are mentioned mentioned multiple times in the Bible. Most translators recognize the ostrich in Leviticus (11:16) along with the owl, seagull and hawk, indicating it was recognized as a type of bird despite the fact that the ostrich cannot fly. Job 30:29 finds the ostrich identified with the desert or wastelands. 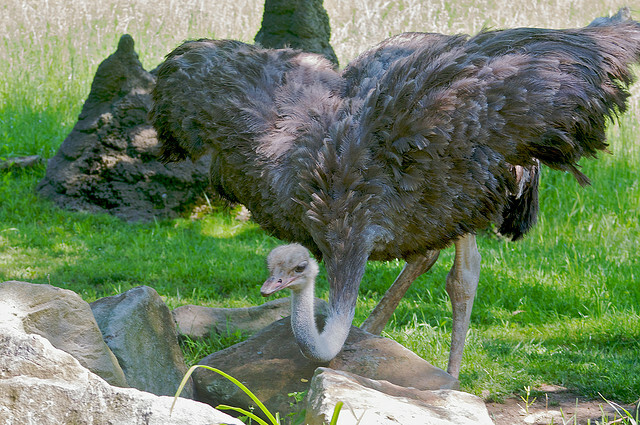 In Lamentations (4:3) the ostrich is used as an illustration for the lack of attention of parents toward their children. But the most complete description of the Ostrich in the Bible is found in Job 39 verses 13-19. The wings of the ostrich wave proudly, But are her wings and pinions [like the] kindly stork’s? She forgets that a foot may crush them, or that a wild beast may break them. Because God deprived her of wisdom, and did not endow her with understanding. When she lifts herself on high, she scorns the horse and its rider. The context of Job 39 is God’s response to Job. His response begins in chapter 38 where He asks Job where he was when He laid the foundations of the earth and then proceeds to describe many parts of His creation and asks; what can man know? In chapter 39 God turns His attention toward the animals He created. What do we learn about the ostrich here? First, they have wings and feathers, but not like those of a stork which are beautiful and enable flight. Second, the female ostrich lays her eggs on the ground in the dust and is prone to forgetting or ignoring some of the eggs which result in their either being crushed or eaten by other beasts. Third, the ostrich is observed to be rather callous toward her young and does not tend them, presumably in comparison to other birds that dote on their chicks. And what accounts for these aspects of the ostrich ? God himself proclaims that He did not endow the ostrich with understanding. We could say that God didn’t endow the ostrich with the same parental characteristics as some other birds. Lastly, we see that, though not endowed with wisdom, when the ostrich lifts itself up to run it can put the horse and its rider to shame. While many of these characteristics appear unflattering or sub-optimal to our sense of perfection, God says here in Job 39 that he made them this way. A Modern Natural History of the Ostrich. Before exploring the implications of this text further, let us consider the contemporary ostrich and see how it compares to the descriptions of the ostrich in Job. The ostrich is the largest living bird weighing up to 300 pounds and standing more than six feet high. Contemporary ostriches are native to Africa. All living ostriches are considered to be members of a single species, Struthio camelus, though there is considerable variation among populations and there are more than ten extinct species described from Africa and Asia. They are a flightless bird and are morphologically (ie. physical features internal and external) and genetically most similar to other flightless birds such as the emu, kiwi, and extinct moa from New Zealand, some of which were much larger than the ostrich. The ostrich has “wings” that are too small to allow flight yet they have one of the largest wingspans (over two meters) of all birds. The ostrich lacks a bone where some of the flight muscles would be attached and its large feathers lack the intricate lateral hooking system found in birds that can fly. Though unable to fly, their large size and powerful legs enable them to run at over forty miles per hour for extended periods of time (the cheetah can only attain these speeds for a few seconds) to escape predators. They do use their wings to cover their featherless legs for warmth on cold nights and for courtship displays. They also have two claws at the tips of the wings, which may be for defensive purposes. They live in desert regions where they are well adapted to hot and dry conditions. 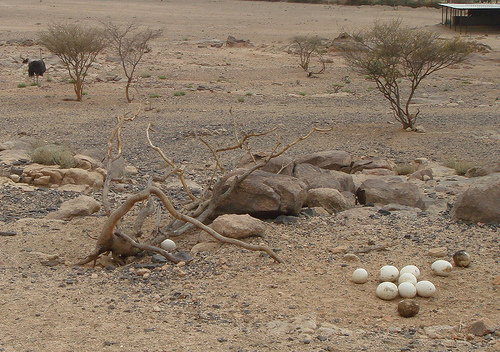 An ostrich nest with eggs. here we see a group of eggs in the center of the nest which are the primary eggs that will be incubated in the evenings usually by the male. The eggs pushed off to the sides are the result of the dominant female pushing aside eggs laid by other females. These eggs will never hatch and will be scavenged. 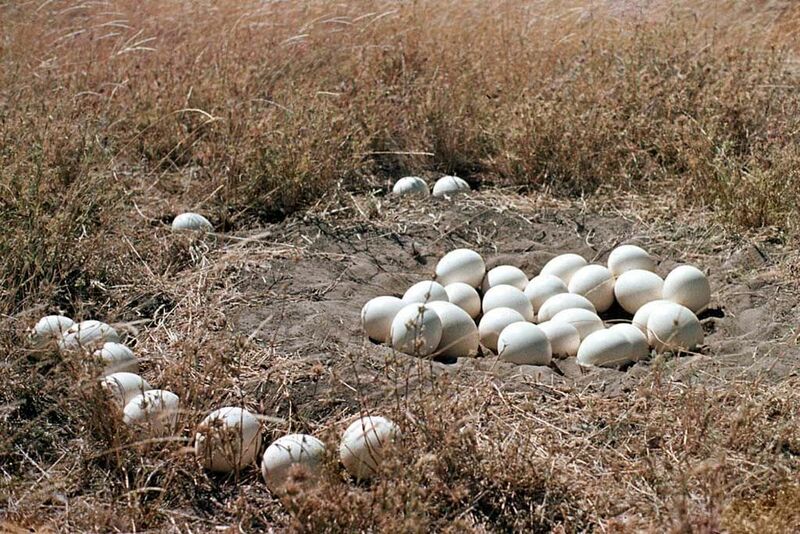 Female ostriches will lay eggs in a dirt nest that has been prepared by the male ostrich. Multiple females will use the same nest but typically the last female to lay eggs is the dominant female and she will roll and kick many or all of the previously-laid eggs out of the nest (see picture). This has the effect of insuring that only the dominant females genes will be passed down to the next generation. The female and male will periodically take turns incubating the primary eggs with no attention paid to the surrounding eggs. Among the eggs that are incubated, many are lost or broken in the dirt nest. Even after hatching, it is the male ostrich that will take care of the young of which only 15% typically will survive to reproductive age with the others becoming prey to a number of predators. Despite these difficult survival odds , ostriches are long-lived birds allowing them 20-40 years to attempt to produce offspring. Therefore even if only 15% of offspring reach maturity, dominant ostriches may have many offspring that survive to the next generation. One last relevant behavioral trait we observe in ostriches today is that when ostriches with chicks encounter other ostriches with chicks there is often competition for the young with the loser giving up their chicks to the victor. Another ostrich nest showing the simple dirt nest with eggs pushed out of the nest. If we compare the modern ostrich to the Biblical descriptions, we find that the Job contains a remarkably accurate description of the modern-day ostriches. The author of Job (who is reporting the dialogue of God to Job) correctly identifies the ostrich as a bird despite its flightless nature and accurately describes the maternal behavior of the modern ostrich, with respect to not taking good care of both eggs and chicks. (1) The female is not invested in the parenting of offspring and considering the rates at which eggs and chicks are lost or given up, , it is understandable to believe that ostrich parents don’t seem to care. All together, many people, like Job, his friends and us today, might expect God to have create a bird that doesn’t display such seeming wasteful and even cruel behavior. Thus, the ostrich’s behavior may, to man, represent a creation paradox. God does not suggest that there is anything in the least wrong with the ostrich. Quite the opposite, He draws our attention to these characteristics and says that He is the one that has withheld understanding from the ostrich and is taking responsibility for the observed behavior of these birds. We will explore the implications of this in the context of the “good” creation of Genesis 1 in Part II of this series on the ostrich. One final observation: the origin of the book of Job is unknown. Many modern scholars believe it to be only as old as the 6th century BC but the dominant view in historical Christianity is that the events recorded in Job occurred at the time of the patriarchs or, possibly, as late as the time of the Solomon and thus included with the wisdom literature of his age. Pertinent to our discussion in Part II, most literal six-day creationists, as exemplified by Ken Ham and his apologetics ministry Answers in Genesis, take the position that Job is an ancient text because they believe that it records life very soon after Noah’s catastrophic global flood. They believe there was a single Biblical Ice Age which coincided with the time when the nations were dispersing from Babel and may have lived in caves due to the harsh climate. Furthermore, young earth creationists believe this was a time when the animals that had been preserved on Noah’s Ark were rapidly speciating into thousands of diverse animal types from a “common ancestor” pair that had been on the Ark. We will discuss the merit of these views in light of what God tells us about His creation in Job, beginning in Part II. For now, marvel at the wondrous ostrich that God hath made. You have some excellent points in your “Observations” section. Although all hens lay their eggs in the dominante female’s nest, apparently only she and the dominante male incubate and raise them. While “God’s” description of ostrich’s behavior is very good, (and very poetic), I would disagree with the part about not imparting the ostrich with wisdom. For starters, she can tell her eggs from those of the other females. She knows it is unwise to invest precious resources to raise all the young left in the nest by the other females, (could she and her mate really sucessfully hatch and raise that many chicks without sacrificing their own?). She knows to sit on the eggs during the day, when her dusky feathers serve as the best camoflage, and the male knows to sit on them at night when his black feathers are the best camoflage. But, I completely agree with your point that the evidence would appear on the surface that the ostrich doesn’t know what she is doing and doesn’t care for her chicks. Thank you for those wonderful observations between Job’s ostriches and the ostriches of today!